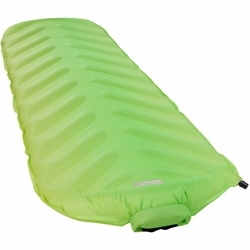 Therm-a-Rest Trail King SV Sleeping Pad. By combining SpeedValve™ technology with AirFrame™ Construction, Therm-a-rest created a backpacking mattress that inflates in a matter of seconds. Plus, thanks to the auto-reversing SpeedValve, the mattress deflates at remarkable speeds. This unprecedented ease-of-use is fused with 2.5 inches of ultra-supportive loft and an R-Value of 1.8, making the Trail King SV a reliable and three-season mattress designed to save you precious time in the backcountry. Stuff sack included.